New emperor, old clothes? International funding – who’s setting the agenda? 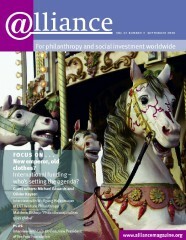 The special feature in the September issue of Alliance looks at international funding and ‘philanthrocapitalism’. How do the characteristics of philanthrocapitalists – in other words, philanthropists adopting business methods – play out in the international funding arena? In particular, what are the implications for donor control and agenda-setting? Who identifies needs and solutions? The special feature includes a series of articles looking at some developing country organizations that are succeeding in negotiating with northern funders and determining their own agendas – TrustAfrica and the African Women’s Development Fund; the recently established Foundations for Peace network; and SPARC in India. It also has interviews with Wolfgang Hafenmayer of LGT Venture Philanthropy, Alain Merieux of Fondation Merieux, and Alex Pryor of Guayaki exploring relations between philanthropy and business. This issue of Alliance also includes an interview with Luis Ubiñas, new President of the Ford Foundation. Aid in the 21st century: who’s in the driver’s seat? Investors’ perspectives: Microfinance going mainstream? MCI: fad or serious opportunity? Plug pulled on the Microfinance Management Institute? ‘New’ philanthropy as the new development solution? Finding a niche or meeting the need?